How money is created - choose the future! The economies of developed countries have evolved in such a way that they must always grow, or they will collapse. To avoid economic collapse, the governments of developed countries usually aim to have their economy grow exponentially by 2-3% every year, which means the size of the economy, and therefore the amount of money in the economy, will double every 23 to 35 years. This economic growth represents a huge increase in the amount of money in the economy, money that must come from somewhere. Mostly, people think that this money is created by their government, but this is not the case; over 90% of money is created by private banks when they lend money. Most people in developed countries borrow money for the things they want to own. When we borrow money from banks, or other financial institutions, we don't give much thought as to where the bank gets that money from — mostly we assume that the money comes from the money that other people have deposited into the bank. It doesn't; in fact, the money that we borrow is created from nothing by the very process of our borrowing it: the act of borrowing it brings it into existence; that is, the act of borrowing the money creates it. This is where the money that allows the economy to grow comes from: we all, individuals, businesses, and governments, create the money that becomes economic growth when we borrow it into existence. When a bank lends you money it creates two things: for you, money in your bank account for you to spend and, for itself, a record of your promise to pay the money back in the future. Your promise to repay the money is a valuable asset for the bank and the money you are borrowing is a liability for the bank. That liability is balanced by the asset, so the bank's ledgers are balanced, and your loan money has been created by nothing but the value of your promise to pay it back. 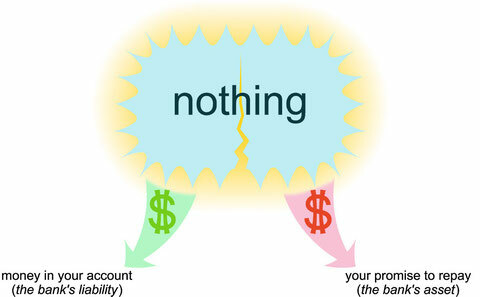 'Nothing' is split into two things: money in your bank account – a positive value to you, and your promise to repay the loan in the future – a negative value to you. If you add these values together they will cancel each other out and return to 'nothing'. In fact, you could do this by simply paying the loan off with all of the money that you have borrowed: the money that you have borrowed (and your debt) would simply disappear. "Only commercial banks and trust companies can lend money that they manufacture by lending it." "Commercial banks create checkbook money whenever they grant a loan, simply by adding new deposit dollars in accounts on their books in exchange for a borrower’s IOU." "I am afraid that the ordinary citizen will not like to be told that banks can and do create money." "If there were no debts in our money system, there wouldn’t be any money." Although the idea of creating money this way makes some sense, there also seems to be a big problem. The money that you borrow, created by your debt, is effectively a balance typed into your account by your bank; it would seem that the bank has nothing to hand out when you buy things with that money — how can the bank provide that money to the people that you spend it with, when the bank has nothing to give out other than a record of your promise to repay the money in the future?